Passengers board Metro subway trains during rush hour on June 3, 2008 in Los Angeles. L.A. subway riders have peace and quiet since there's no reception underground to make phone calls, but that silence will break at the end of March. 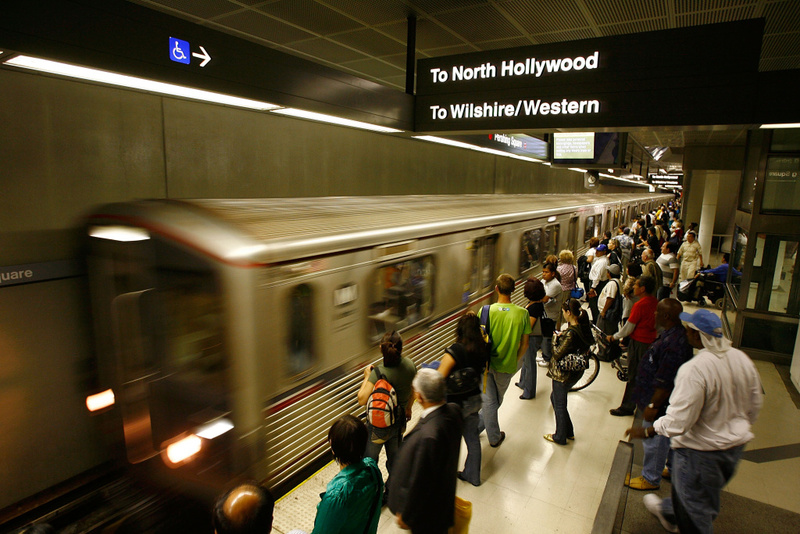 The Los Angeles Metropolitan Transit Authority tells Take Two that it plans to have cellular service available in the subway starting in the coming weeks. Metro spokesman Dave Sotero said the agency will roll out cell service to the underground tunnels linking Union Station and the stop at 7th/Metro at the end of March. When it begins, you'll be able to make a phone call or use the Internet on your smartphone — and potentially be annoyed by passengers having loud conversations next to you. Meanwhile, the L.A. Department of Trasportation tells us it will usher in Wi-Fi on all its Commuter Express buses by the end of 2016. The department first piloted Wi-Fi on buses for a six-month period that started in January 2015. A select number of buses still offer free Wi-Fi to passengers, but the spokeswoman Lisa Martellaro-Palmer says the L.A. DOT will expand to all routes in the coming year.